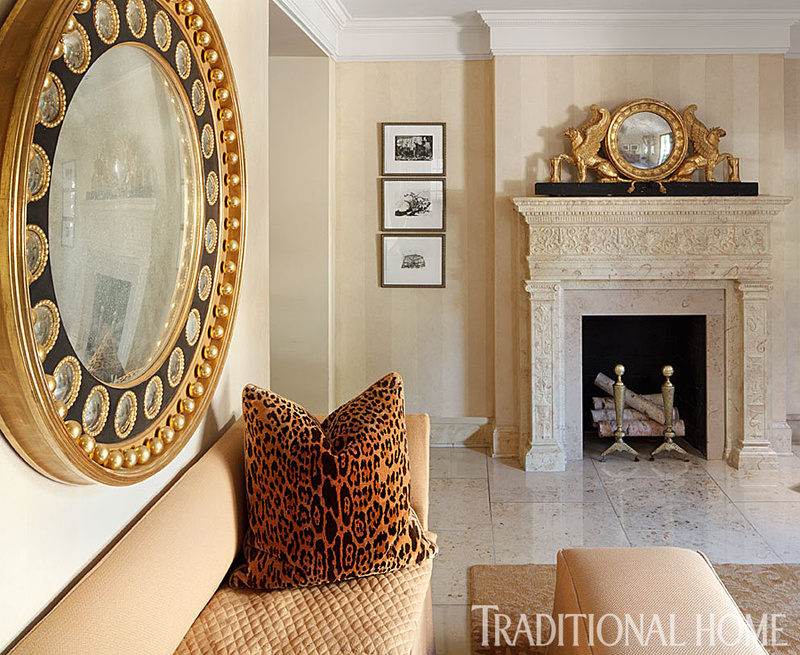 Designer Mary Douglas Drysdale made the foyer’s original fireplace a focal point by placing an 18th-century gilded overdoor with a bolection mirror on the mantel. Mirror on mantel (English Regency); andirons (English): antique. Art flanking mantel (by Per Kirkeby): owner’s collection. Settee: John Saladino, Saladino Style, saladinostyle.com. Mirror over settee: Drysdale Collection, 202/588-0700. Ottoman (custom): Mary Douglas Drysdale, marydouglasdrysdale.com. Ottoman fabric (“Couture Interlace N.5”/Clay #9708-4): Glant Couture, glant.com. 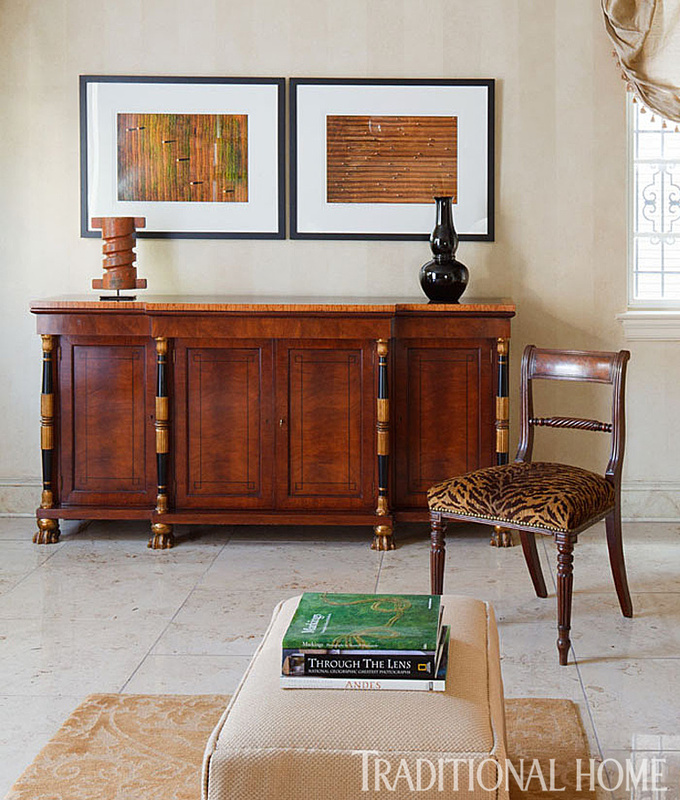 Animal prints from Kravet (on Regency-style chairs) appeal to homeowner Barbara Sullivan’s sense of fun. Commode (“Breakfront Cabinet” #5332): Baker, bakerfurniture.com. Art over commode (by Maxwell MacKenzie): Cross MacKenzie Gallery, crossmackenzie.com. Black vase: Hines & Co. Showroom, 202/484-8200. Sculpture: J. Lambeth Showroom, 202/646-1774. Area rug: Patterson, Flynn & Martin, pattersonflynnmartin.com. Chair fabric (“Plush Tigress” #29179): Kravet, kravet.com. Drysdale started on the home’s lower level, designing custom millwork and choosing new marble flooring for the sitting area off the formal living room, in order to bring a touch of historic charm to the formerly haphazard, too-modern addition. A neutral palette allows the focus to remain on the strong, traditional lines of the living room furniture, such as the “Marler” sofa and “Virginia” chair from Hickory Chair, both upholstered in Manuel Canovas fabric. Walls (custom): glaze by Rising Tide Inc., risingtideinc.us. Area rug; secretary: Drysdale Collection, 202/588-0700. Art (by Lyn Horton): Cross MacKenzie Gallery, crossmackenzie.com. Sofa (“Marler Sofa” #108-80); lounge chairs (“Virginia Chair” #1527-24, by Suzanne Kasler): Hickory Chair, hickorychair.com. Sofa and lounge-chair fabric (“Savannah”/Ecru #4575-03, by Manuel Canovas): Cowtan & Tout, cowtan.com. Pillow on sofa (“Overland Desert” #16476.16): Kravet, kravet.com. Wooden arm chair (“Governor Alston Arm Chair” #2543, Historic Charleston Collection); pedestal table; pillows on lounge chairs: discontinued. Side chairs at table: antique. Fabric on side chairs (“Panthera”/Black, Gold #BF10129.960, by GP&J Baker): Lee Jofa, leejofa.com. Drysdale's next step was to turn her attention to the kitchen. While the space had plenty of pretty natural light, it wasn’t taking advantage of it, which made it feel heavy and unwelcoming. 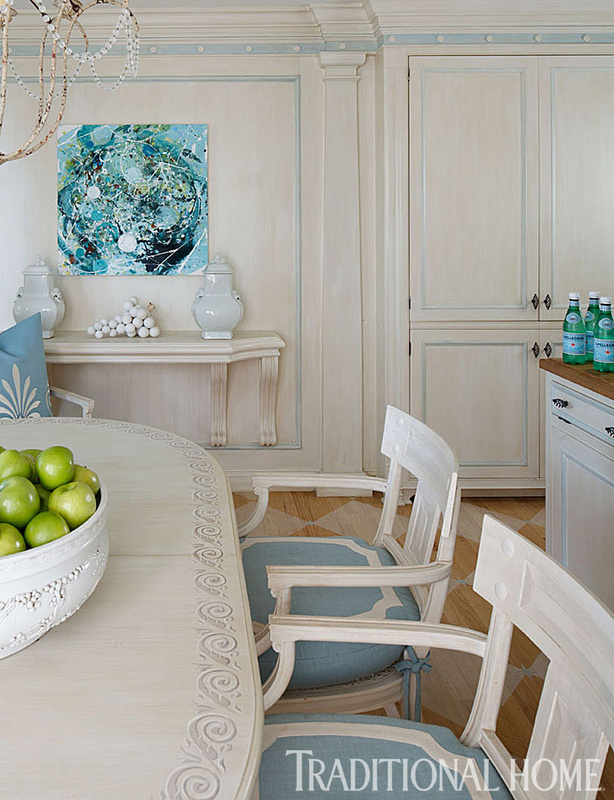 Armed with a large stack of paint chips and fabrics, Drysdale sat down with Barbara to find the ideal colors that would lend energy and excitement to the room. “I must have showed her about 375 options because I needed to find her the perfect shade of blue,” Drysdale recalls. “Barbara’s a wonderful cook, but she spends a lot of time traveling for work. 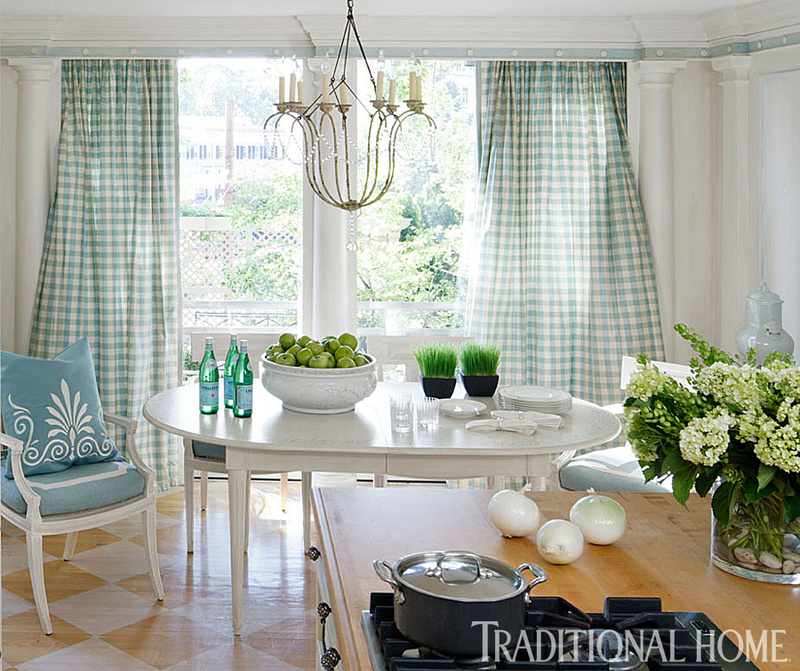 I wanted her to be able to walk into the kitchen and have it feel like a breath of fresh air.” Together, the two decided on a silk checkered fabric for the draperies that would accomplish just that, while also setting the groundwork for the rest of the room’s design. A generous dose of blue in the Cowtan & Tout checked silk curtains and in the Duralee fabric for the cushions on the Michael Taylor chairs infuses the room with a fresh, calming vibe, as do the Niermann Weeks chandelier and the painted floors by Billet Collins. Wall and cabinet paint: custom. Cabinetry (custom): designed by Mary Douglas Drysdale, marydouglasdrysdale.com. Chandelier (“Italian Chandelier”): Niermann Weeks, niermannweeks.com. Decorative finish on table: Billet Collins, billetcollins.com. Dining chairs (“White Arm Chair” #0700): Michael Taylor Designs, michaeltaylordesigns.com. Chair-seat fabric (“Silk Ottoman” in Ivory and Aqua, discontinued): Clarence House, clarencehouse.com. Pillows on dining chairs: Drysdale Collection, 202/588-0700. 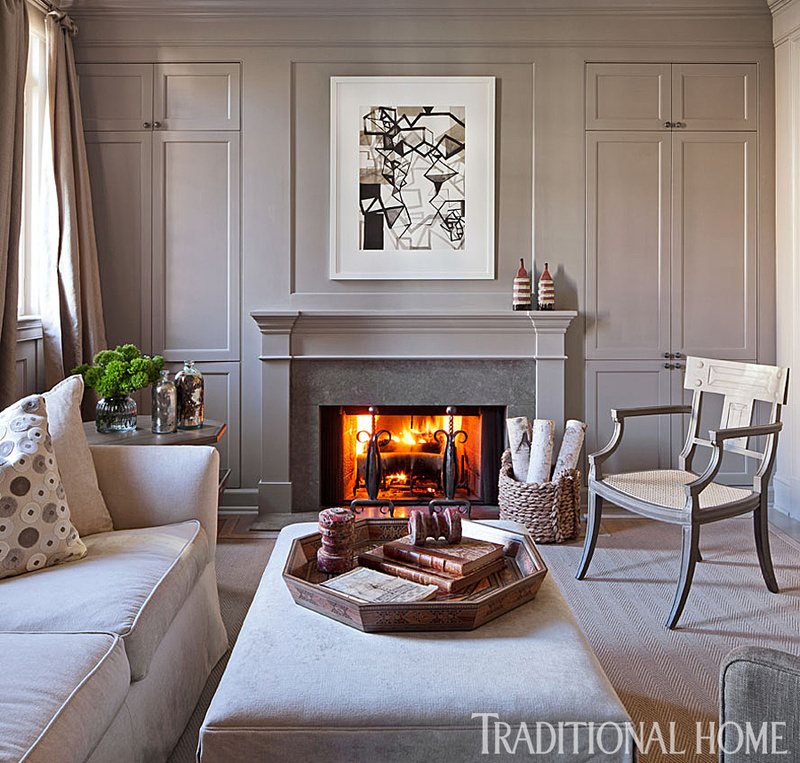 The frieze detailing on the crown moldings is the same shade of blue that appears on the matching cushions atop the Regency-style chairs at the kitchen table. By contrast to the kitchen, the rest of the house is done in soothing, neutral tones that appeal to Barbara’s love of fuss-free, no-nonsense design. 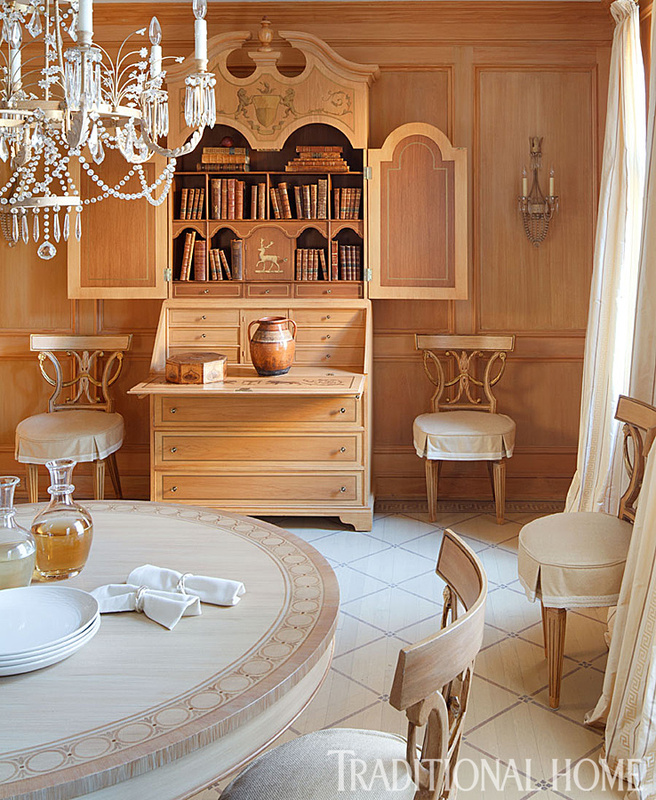 In the dining room, a Niermann Weeks chandelier presides over this elegant space. Armless 18th-century dining chairs with slipcovers crafted from Rogers & Goffigon fabric surround a Baker table, which, like the stenciled floors, was painted by Tom Hickey. Decorative painting: Rising Tide Inc., risingtideinc.us. Dining table; secretary: Drysdale Collection, 202/588-0700. Dining chairs; mirror on mantel; urn on secretary: antique. Chandelier (“Swedish Crystal Chandelier”): Niermann Weeks, niermannweeks.com. Drapery (#26409-23, discontinued): Kravet, kravet.com. A charmingly detailed secretary, a classic Drysdale design staple, dominates the wall opposite the dining table. 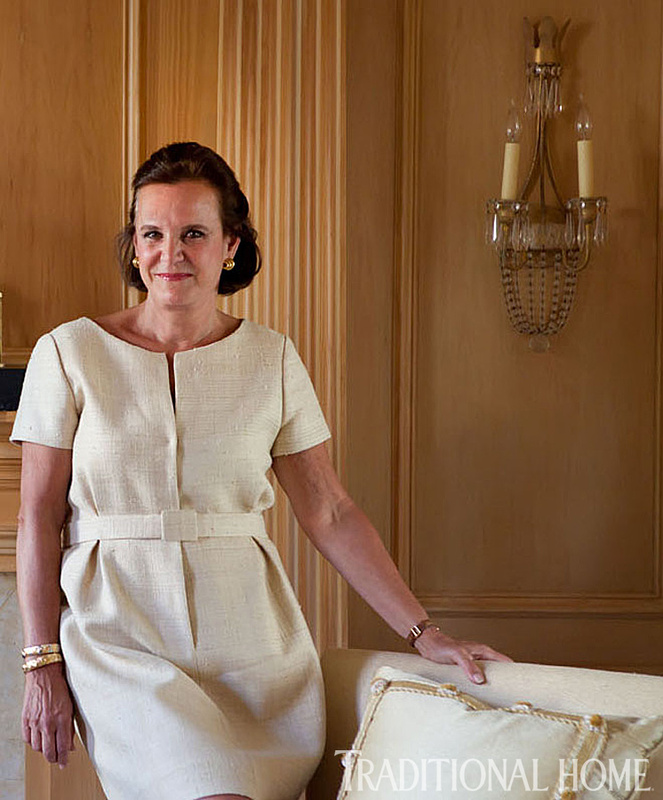 Homeowner Barbara Sullivan poses in her much-admired dining room. 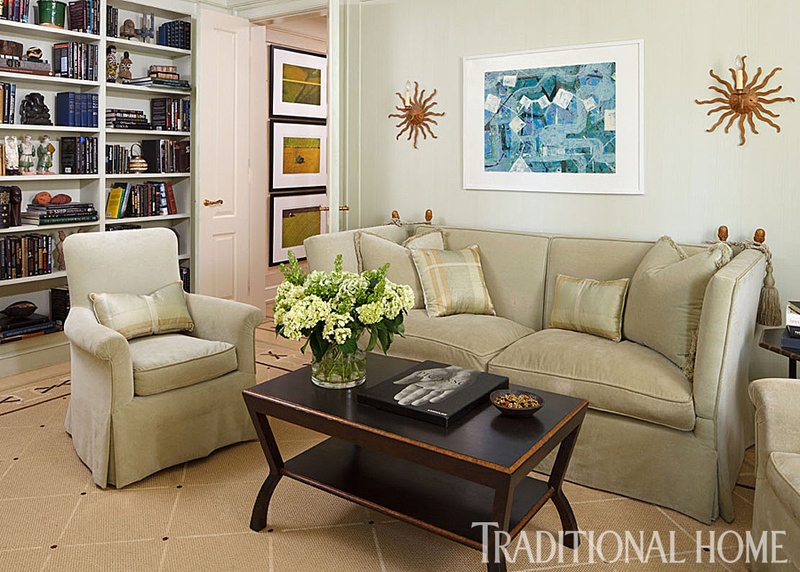 Art by Maryanne Pollock hangs above the green velvet sofa in the Sullivan's home library. Bookshelves were custom designed by Drysdale. Area rug; coffee table; sofa; art behind sofa (by Maryanne Pollock); octagonal end tables: Drysdale Collection, 202/588-0700. Lounge chair: Michael Taylor Designs, michaeltaylordesigns.com. Sofa and lounge-chair fabric (green velvet): Yoma Textiles, yoma.com. Bookshelves: designed by Mary Douglas Drysdale, marydouglasdrysdale.com. Art seen through door (by Maxwell MacKenzie): Cross MacKenzie Gallery, crossmackenzie.com. The master suite—which makes use of most of the home’s third floor and includes the Sullivans’ bedroom and bath, as well as a study for Bill and an office for Barbara—is calm and cohesive thanks to the creams, grays, and beiges that pervade the spaces. There are no loud colors or busy patterns; the important thing here is that each room fulfills its purpose, whether it’s to allow the couple a place to finish work or indulge in a little relaxation. Walls (naive graining): Rising Tide Inc., risingtideinc.us. Area rug: J. Brooks Designer Floors, 703/698-0790. Bed (custom): Drysdale Collection, 202/588-0700. Headboard, bed-cover and drapery fabric (“Trapunto”/Igloo #93105-06): Rogers & Goffigon, 203/532-8068. Bed linens: D. Porthault, dporthaultparis.com. Throw on bed (“Shetland”/Camel and Beige #4677-07, by Manuel Canovas): Cowtan & Tout, cowtan.com. Art (by John Brown): Cross MacKenzie Gallery, crossmackenzie.com. Framed photographs by John Brown from Cross MacKenzie Gallery offer the sole bit of color in the homeowners’ sanctuary, joining neutral accessories like the oversize rug from Patterson, Flynn & Martin, as well as bedding and drapery crafted from the same Trapunto fabric in Igloo from Rogers & Goffigon. A silver sunburst mirror from Baker shines above the three-drawer chest from the Drysdale collection. Beige "Ocelot" fabric on the antique chairs adds pizazz. Three-drawer chest: Drysdale Collection, 202/588-0700. Mirror over chest (“Sunburst Mirror”/Silver #7013S): Baker, bakerfurniture.com. Chairs; figurines on chest: antique. Chair fabric (“Ocelot”/Ecru, Beige #10877-01): Cowtan & Tout, cowtan.com. Candlesticks on chest: Holly Hunt, hollyhunt.com. 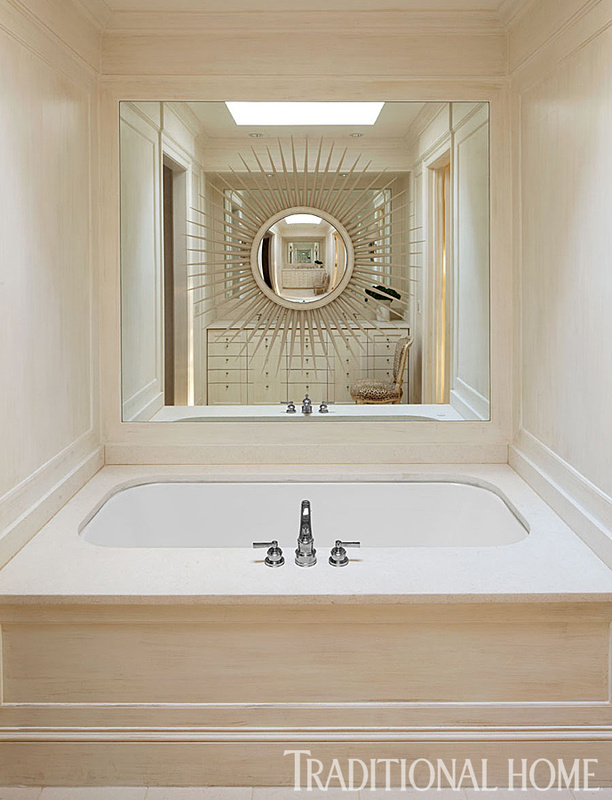 The mirror above the deep soaking tub in the bath reflects a double vanity on the opposite wall. Tub; faucets; sconces: Waterworks, waterworks.com. Vanity: design by Mary Douglas Drysdale, marydouglasdrysdale.com. Mirror (“Sunburst Mirror”/Silver #7013S): Baker, bakerfurniture.com. Walls and surfaces (custom glazed and antiqued): Rising Tide Inc., risingtideinc.us. Artist Maryanne Pollock’s contemporary painting over the fireplace adds an unexpected edge to Bill Sullivan’s personal escape off the master bedroom, which is otherwise as traditional as they come, with gray paneled walls, a Rose Tarlow sabre leg chair, and an R. Jones sofa. Walls (custom glaze): Rising Tide Inc., risingtideinc.us. Art over mantel: by Maryanne Pollock, maryannepollock.com. Area rug (solid gray sisal): Patterson Flynn & Martin, pattersonflynnmartin.com. Wooden arm chair (“White Arm Chair” #0700): Michael Taylor Designs, michaeltaylordesigns.com. Sofa (“Lindsay Sofa”): R. Jones & Assoc., rjones.com. Ottoman (custom, “Cocktail Ottoman” #7168-53): Hickory Chair, hickorychair.com. Sofa and ottoman fabric (“Featherweight”/Green Tea, discontinued): Kravet, kravet.com. Pillow with velvet dots (“Broome Velvet”/colorway discontinued #GWF 2915-11, by Groundworks): Lee Jofa, leejofa.com. Drapery (“Neptune”/Silver #8821-02, by Larsen): Cowtan & Tout, cowtan.com. Art to right of mantel (by Lyn Horton): Cross MacKenzie Gallery, crossmackenzie.com. Tray on ottoman: Timothy Paul Collection, 202/234-2020. 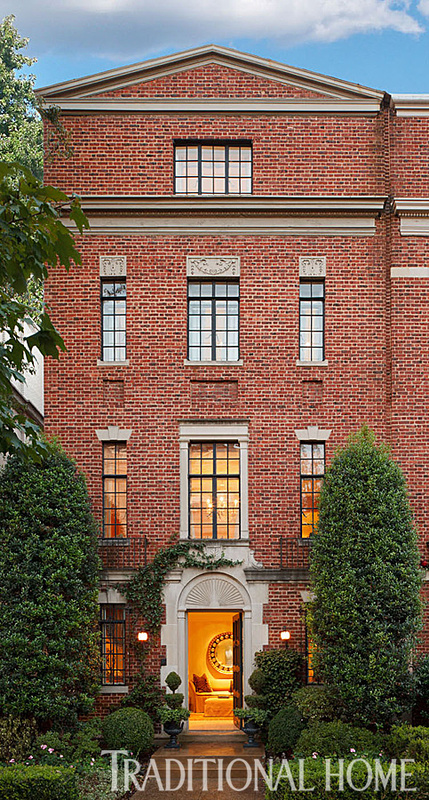 Renovations to the 1924 house continued outdoors with elegant, classic plantings.